The Delta Lloyd Regatta in Medemblik, the Netherlands lived up to its wet and windy reputation! We earned our best international finish ever, 4th overall and 2nd women’s team of 24 boats. Results here. Congratulations to our friends and training partners, Annemiek and Annette of the Netherlands, for their victory! Ramon could not coach us during our training or racing so it was a good chance to test our self-reliance and ability to analyze the racecourse before and after each race in order to make adjustments to our game plan before the next race. We also felt fast which has given us confidence in our ability to set up the mast tensions and sail shape correctly and make correct adjustments for wind transitions based on what we feel in the boat rather than external feedback. Finally, we felt really good about almost all of our starts as we won several of them and many of our competitors had at least one OCS (over the start line early) during the event. This regatta was also our first Medal race, which is a final race for the top ten boats. Not only is it about half the length of a normal race, but it’s also worth double points to make it more nerve-wracking for spectators and athletes alike. We won the start were leading for two laps until we dropped the spinnaker too late at the second gate rounding, making for a slow rounding and being pushed to the unfavored side of the course. We finished the race in 6th but we still easily maintained 4th overall in the regatta. 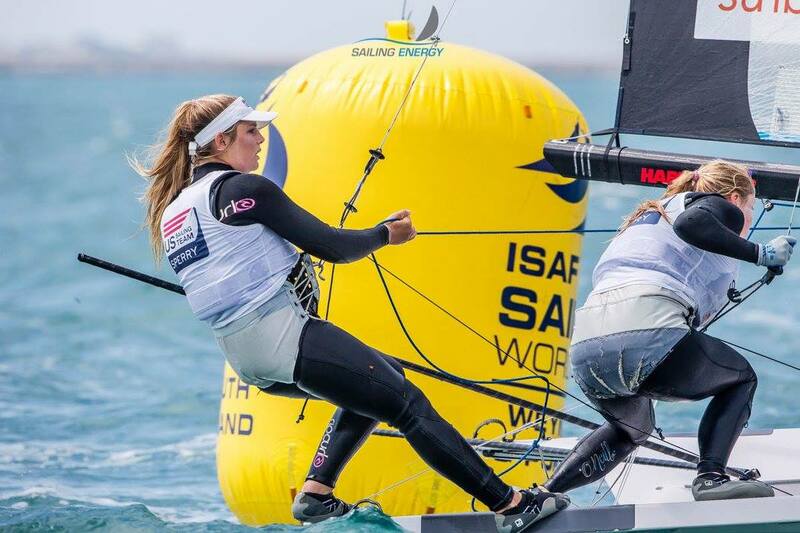 After traveling from the Netherlands to the UK and a short break, we had five days of solid training before the ISAF Sailing World Cup Weymouth started, but what we weren’t prepared for was the wave state that we would be sailing in the first two days of the event. The World Cup in Weymouth (the site of the 2012 Olympic Games), was a wake-up call to conditions that we aren’t as comfortable in and it tested our “grit”. While the first two days were extremely frustrating, we pulled together a strong final day, determined to end on a better note. The first day served to be extremely challenging. We started the first race very well but ended up being mid fleet as we went to the wrong side. Although this is normal for your first race of the regatta as you start settling into patterns and tricks of the racecourse, what we still couldn’t figure out was the difficult swell. With a capsize in each of the second and third races, the races felt like a game of catch up and we ended the day in 20th. The second day proved to be equally as challenging as the first. With lots of motivation to do better and move up the in the results since the points were so close, we started off the fourth race well again. But with a capsize at the end of that race and one in the final race, a day that was supposed to be a 10, 13, 7, ended up being a 24, 13, 24. We were frustrated and confused to why we would let ourselves capsize not only twice that day, but also twice the day before. The third day of the regatta resulted in no racing due to lack of wind. We were disappointed to not have a chance to race with all cylinders firing, and instead we were to only have four more races to end the regatta. The final day was sailed in a completely different wind direction with little to no swell. This particular condition of sailing was what we were used too, so we were excited to capitalize on the day! Four races was a really long day on the water, but we were determined to move up in results. We finished with a 14, 12, OCS, 5. The OCS meant that although we finished the race in 10th, we were disqualified since we had started over the line a few feet before the starting gun went off. We spent a lot of time reflecting on this event and besides the obvious (the capsizes), we concluded that for us as a team the swell in the first two days of the event distracted us from all other components of sail boat racing. Instead of focusing on speed and angle like we are used too, we were too caught up in the swell and this mistake made us blind to all other factors that would have made our performance ten times better. We finished the regatta 17th overall out of 28 and still managed to finish top American team. Results here. We were not happy with the way the event ended, but instead of being caught up on all the things that went wrong, we want to learn the most from those mistakes and give it our all to improve. Now we are excited to move on from windy air sailing for a little bit as we get ready for the Pan American Games in Toronto, Canada! We’d like to thank our sponsors, Expedia, Sunbrella, and our title sponsor Sperry. Additionally, the St Francis Sailing Foundation continues to ramp up their support of us which is amazing. And thank you to everyone who has personally donated to our campaign – your belief in us fuels us and we hope we are making you proud! BRONZE MEDAL at the Pan American Games! You bet we’re proud! Good luck for the Pan Americans. Proud as punch! Getting closer to those Olympic rings.